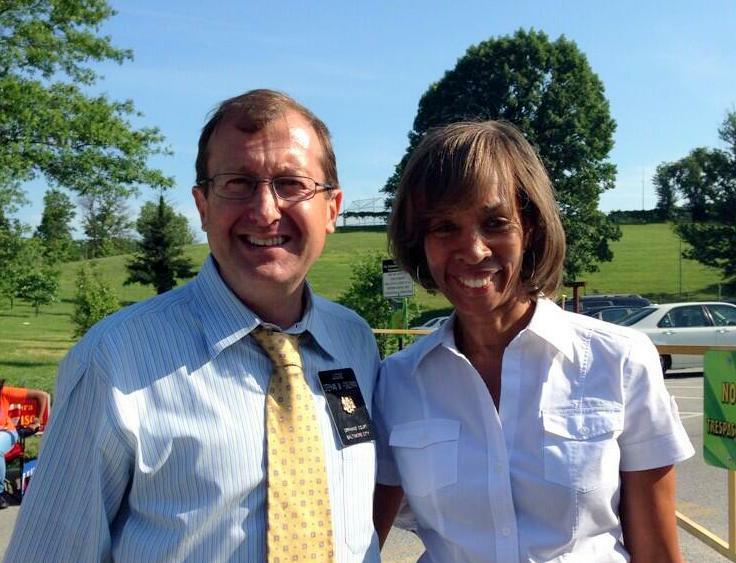 Above: Steve Fogleman campaigning yesterday with State Senator Catherine Pugh. The Baltimore Beer Baron lost. After seven years on his high-visibility platform – chairing the Baltimore City Liquor Board – Stephan W. Fogleman failed to get enough votes in yesterday’s Democratic Party primary to secure a position as a judge on the Baltimore City Orphans’ Court. Voters had to choose three from a field of six candidates. Fogleman came in fourth, behind Michele E. Lowenthal, Lewyn Scott Garrett and Charles “Chuck” Bernstein. The names of the three winners will appear on the ballot in November, but for all intents and purposes they are the winners in Democrat-controlled Baltimore. Fogleman didn’t return a call today for comment. Tweeting informatively – and, for the most part, jovially – as @BaltoBeerBaron, Fogleman used social media to publicize the actions of the three-member Board of Liquor License Commissioners, giving modern-day citizenry a glimpse into the working of a regulatory entity established early in the last century. He even made YouTube videos of some of the board’s hearings, editing and posting them himself. But Fogleman took a serious pleasure in parsing the nuances of cases involving complex legal issues and the sometimes intensely personal competing interests of license transfers and violations. “These kinds of judicial deliberations are something I think I am actually very good at,” he once said. But the release of a damning audit of the Liquor Board by the state in March 2013 clouded and challenged his final year at its helm. The auditors found the agency to be overstaffed and under-performing, with workers expected to conduct 800 inspections annually only completing 41, for example. A lack of written policies, poor record-keeping, licenses that should have expired being allowed to live on – the list of problems was long. Worse yet, a previous audit in 2007 had found many of the same problems. He laid off inspectors, began crafting new policies to formalize procedure, worked with lawmakers and community advocates in Annapolis to hammer out reform legislation that would computerize the record-keeping and otherwise sought to right the ship. But community critics continued to fault the agency for what they said was too much deference given to the licensees, and a failure to enforce the laws on nuisance bars causing neighborhood headaches including drug-dealing, public drunkenness, violence, littering, sanitation and other issues. Fogleman was in the spotlight with cases that stirred strong neighborhood passions, like The Crossbar in Federal Hill and the Voltage nightclub in southeast Baltimore. He campaigned on a slate with the other sitting Orphans’ Court judges, Lowenthal and Garrett, with fundraising handled by high-wattage consultant Colleen Martin-Lauer. But it wasn’t enough. Partisans on both sides of the debate over city liquor issues will debate Fogleman’s tenure in office. And social media compatriots will still watch for his online observations on sports, micro-brew pubs and city life. And keep an eye out for his next move.